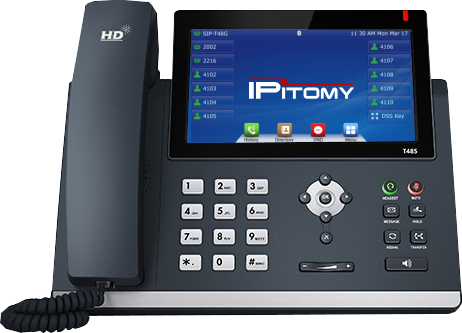 IPitomy offers a complete IPitomy IP PBX System, plus VoIP Calling Services for one low monthly payment. IPitomy provides a warranty, software updates and support for the IP PBX for the entire term. Take advantage of the technology, take advantage of the low cost and take your communications to the next level! IPitomy has been a leading designer and developer of Business Phone Systems for many years. Developing feature rich business phone systems for a wide range of companies from large multi site enterprise organizations to schools, hotels and small retail shops. At IPitomy, the same features that are included in our enterprise grade systems are available for the small business too. Over the past 2 decades, business phone systems have evolved from taking up an entire closet to being a small rack mounted appliance replacing hundreds of pounds of old fashioned telecom gear. As the hardware gets “smaller, faster and cheaper”, the new systems replace large older systems with much more power and performance than outdated hardware based PBX systems. The new solid state technology eliminates some of the failures inherent in previous designs by consuming far less power and generating far less heat, all while maintaining the power and performance required for exceptional business communications. Every business has different needs. That’s why IPitomy offers a complete range of Business Phone Systems that work for every requirement. We know that customers want more than just a phone system. Customers want a relationship with a partner that will provide ongoing support and service all in one place. As a PBX developer and a VoIP Service Provider, IPitomy offers Premise Based Systems, Hosted Systems and SIP Trunking. We support everything under one convenient Umbrella. An Exciting and Refreshing Change! IPitomy offers a high quality phone service that provides telephone services in the cloud, along with a complete PBX system for your office. IPitomy provides the business phone system as well as the telecom services and VoIP calling for one low monthly payment. All you need to do is buy or lease the phones you want and off we go! You can keep your phone number and add Fax over the Internet for the best and most reliable FAX service. Switching to IPitomy’s reliable high quality VoIP services improves performance and reduces costs. With all that money you save, you can get a real nice High End phone! You can expect your new phone bill, including the IP PBX System to be less than you currently pay for just phone lines. All HAAS Agreements are for 3, 4 or 5 years. You can continue to rent the system on a month to month basis after the initial term. If you renew for another multi year term, you get a brand new IP PBX. No high upfront cost for IP PBX equipment. Typical systems could have a significant cost depending on size if purchased. One place for all support and services. One bill. Flexible Service Options, add or subtract services at any time.